On 31 August 1944, German bombs fell on Nowe Miasto (the New Town). One of them smashed through the vault of the St. Kazimierz Church, burying the people who had sought shelter inside. Among the destroyed items there was the tomb of Maria Józefa Sobieska, nee Wessel (1685–1761), the wife of Konstanty Sobieski (1680–1726), son of King Jan III Sobieski (1629–1696). 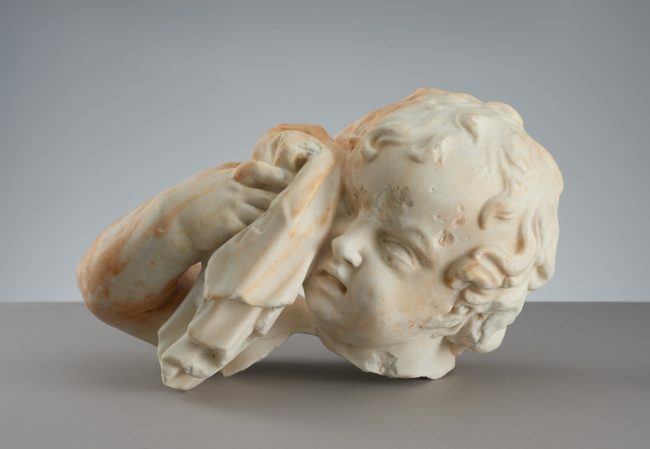 The head of a crying putto is one of its preserved elements. Maria Józefa married the prince despite the negative attitude of the people around him, especially Queen Maria Kazimiera, which is why their wedding ceremony in 1708 took place without the knowledge of the family. Mere weeks after the wedding, Konstanty abandoned his wife and sought to nullify the marriage. The process took many years and eventually resulted in the reconciliation of the couple, but Konstanty died just a year later, in 1726. As a widow, Maria managed the Sobieski properties, bequeathed to her by her late husband. In the final years of her life she sold the estate to her nephew, Teodor Wessel, and moved to the convent of Sisters of Perpetual Adoration of the Blessed Sacrament in Warsaw, which is where she died in 1761. Due to her connections to the royal family, heraldry was an important element of the decoration of her tomb – the marble base with an inscription is crowned with two coats of arms: Janina – of the Sobieski family, and Rogala – of the Wessel family. Above it, there was a medallion with a profile of Maria Józefa and a putto on each side. Putti, a decorative element which became popular in the Renaissance, were most frequently used in allegorical and mythological compositions touching upon the themes of fun and love. In religious art, they referred to various symbolic motifs through the use of different attributes. One of the putti on the tomb held a handkerchief in its right hand, using it to wipe off tears, while in the left hand it had an extinguished torch directed downwards – the symbol of fading life. The head of the putto can be found in the collection of the Museum.